of everything it took to get this new pump assembly working. 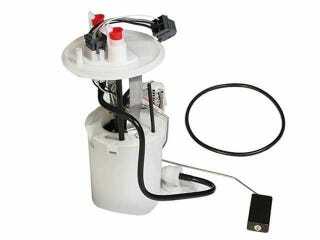 This pump (PN: 23348653), offered by Professional Parts Sweden (“Pro Parts”) is supposed to be a direct-fit replacement, applicable only to early ’90s Saab 900s and 9000s. Sold for about $100, it appeared to be an attractive alternative to OEM Saab & Walbro units costing more than 3 times as much. Let’s start at the top. The lid has two ports, one for pressure, one for return, and both of them were too small to fit the check valve elbows that were supposed to seat inside. But instead of being the “next size down”, they were so close to being correct that we tried to hook it up anyway. The plastic fittings wedged in the bores tightly, preventing us from seating them down all the way under the retainer clips. It was even tighter than the O-rings. We were half-tempted to drill out the bores, but were not confident about how the interior finish would turn out. And besides, the plastic was already slightly thinner and more flexible than the original Saab unit that came out of the car. Any drilling would just make it even more fragile. If that wasn’t frustrating enough, the nylon pump tubing was a larger diameter than the OEM, requiring some modification on our part to plumb the old hat to the new pump assembly. Down next to the basket was the “ejector pump”. The new assembly included some sort of brass orifice in the straw that feeds the pickup basket. This tip was not present on the OEM one. But the worse part was finding a ball bearing wedged inside of the straw, just behind the orifice. It was in there too tightly to push out with an allen key, so we ended up cutting the end of the straw away to remove the bearing and restore fuel flow from the tank to the basket. The engine seemed to run just fine without these pieces, but some further research on “ejector pumps” suggests that the bulb on the side of the basket is a check valve that prevents fuel from draining back after shut-off. If this ball bearing was part of that valve, there might be some side-effects that we haven’t encountered yet. At any rate, the bearing was not doing any good by blocking the straw. It had to go. And even if we figured out how to open the ejector to put it back in there, it would probably just pop back into the line and starve the engine. Finally, the plastic components of the new pump assembly were of a thinner plastic than the old pump. During one of the installation/removals, we even broke off a few teeth from the new included lock ring that secures it in place. We thought we were being careful before, but after that, we were sure to handle all parts extra-delicately. Surely we wouldn’t have had all this trouble with an expensive OEM pump. Was it worth saving $200? Eh, probably. But “Pro Parts” sure knows how to test one’s patience.